William and Kate in next year's London Marathon? There are endless reasons why people choose to run the marathon. To prove to themselves they can, to honor a deceased family member, or simply because they enjoy it. But running a marathon because you're an actual prince, and your royal brother tells a reporter during a live interview, that you're going to run the famous 42k, must be unique! Prince Harry, who is well known for his practical jokes, announced that Prince William and Princess Kate will be participating in next year's London Marathon. Looking like he was thoroughly enjoying himself he then added: ''He's gonna have to now, isn't he?!' With a brother like that, who needs enemies?! 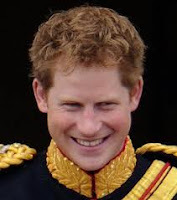 Enjoy Prince Harry as he puts his brother in a difficult spot! Oh my!! Talk about calling someone out!!! I heard that and thought it would be cool. My guess though is that unless they have security guards that can run a marathon as well, they won't.